There seems to be a growing consensus on the left that the environment is ground zero for our work. The capacity for capitalism to destroy the earth through mining, fracking, consumption, waste, destruction of watersheds and other natural elements seems to know no reasonable limits. While activists have long targeted environmental degradation, placing eco-justice at the centre of organizing that isn’t soley focused on the environment has taken some time. With analyses that have emerged that frame environmental destruction in terms of environmental racism, colonialism and neo-colonialism, activists are making more appropriate and fundamental links between how ecological destruction is at the core of the oppression we fight locally and globally. This focus on eco-justice is especially pertinent right now as Idle No More protests have broadened the awareness of the most pressing environmental issues in Québec and Canada. The relentless campaign has helped to tie eco-justice to other progressive struggles and re-frame discussions about sovereignty, self-determination and settlers’ responsibility to be in solidarity with Indigenous activists. 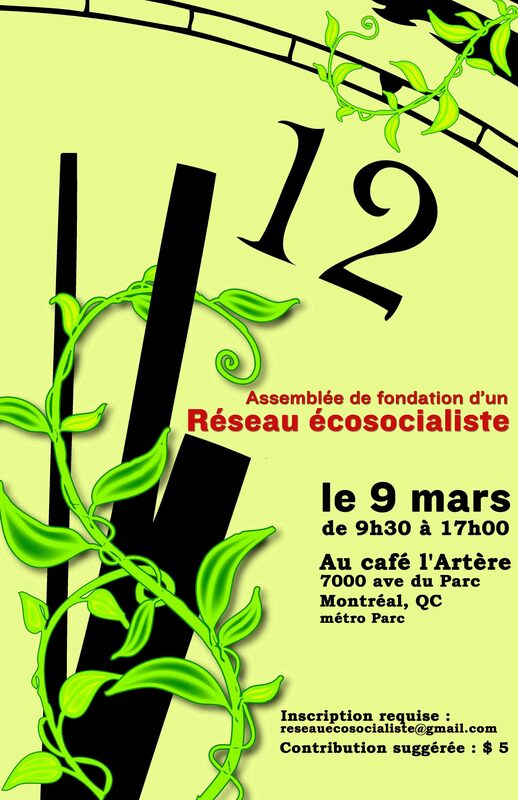 In Québec, many socialists and anti-capitalists see ecosocialism, the junction of socialism, Marxism and critical ecological justice, as a necessary framework under which to organize. Ecosocialism is an analysis that correctly identifies capitalism and the pursuit of profit as the driving force behind environmental destruction and climate chaos. On March 9, more than 70 activists from regions across Québec gathered in Montreal in what many called an historic meeting. Together, unaffiliated anti-capitalists and members of the socialist collectives that exist within Québec solidaire: Gauche socialiste, Alternative socialiste, Mass critique and the International Socialists passed a statement of unity and statutes that form the basis of the new organization. The meeting started with four presentations that outlined local and international political contexts. The rest of the day was spent debating and discussing a basis of unity and statutes that had been drafted and circulated in advance of the meeting. The Réseau écosocialiste’s statutes establish a membership structure, open to members of Québec solidaire and people in solidarity with the party’s goals. The new steering committee was elected at the end of the meeting and is comprised of five women and three men, me included. The Réseau’s coordinating committee will spend the next few months setting up regional and local networks, general assembly structures and implementing a plan to reach out to potential members of the group. Create and maintain links with ecosocialist organizations around the world. While I’m still new to progressive organizing in Québec, I’m no stranger to the struggles and challenges that exist in trying to unite activists on the left around a common vision and set of goals. The ease with which the group debated, modified and passed the basis of unity and the statues signaled a readiness of everyone present to work together under this new banner. Québec solidaire is the only progressive, anti-neoliberal political party in Québec but is not free from the conservatizing forces that electoral pressures can place on any progressive structure, especially one with two members elected to the National Assembly. One of the tasks of the Réseau will be to engage Québec solidaire members and supporters to ensure the party maintains its progressive core. If Québec solidaire is truly going to be a party at the ballot box and in the streets, a phrase used by many QS activists, the Réseau will be critical to more formally link the party with social movements. As was clear during the student protests last year, the power of people in the streets is much more significant than the power held at the National Assembly. Québec solidaire is the only political party that can amplify the voices of activists among social movements, though the connection needs to be strengthened; no small task, but perhaps a task just as large as getting a room full of socialists to agree to unite under a common set of statutes and a basis of unity. I enjoyed your rabble article on ecosocialism. You may be interested in my website at http://www.healermovement.info.